Online Reputation Management for a small business is about how you monitor, review, and respond to what is said about your local business on the web. In an earlier post I discussed how to get online reviews for you local business and how you should welcome reviews rather than avoid them or bury your head in the sand. This post will elaborate on that theme and focus on what to do when you get them. Anybody doing business on the Internet can be subject to both good and bad publicity. Good publicity for our business is something we all strive to earn and maintain, but sooner or later you’re going to brush up against negative publicity. The fact is you need to deal with both appropriately and quickly. Monitoring is about putting in place mechanisms to get alerted when something good or bad is said about your business. As many local businesses have come to find out, one bad review at Yelp or Google Places, or a negative blog comment about you, can ruin your reputation, and suppress customer leads or product sales. Make sure you have a business listing at all the major review sites such as Yelp, Google Places, and Yahoo! and Bing Local, and have somebody monitor them for new reviews daily. Your business should also be on Facebook and Twitter and monitoring comments. 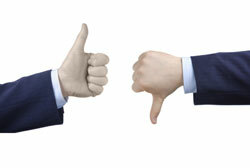 At some point businesses should expect reviews to play a part in where their site will rank in the search engines. While there is no evidence at the moment to suggest bad or good reviews impact rankings – up or down – eventually they may. After all most reviews have a “star” system for ranking and its a small step for the search engines to “read” these and include them in their algorithm. So as you can see keeping on top of local business reviews at places like Yelp is important. But the Internet is huge so how does a local business make sure it can “listen in on it?” There are a number of free tools available but for local businesses my preference is still Google Alerts. Because of the popularity of Twitter I’ve also begun to suggest Monitter as Twitter has become a popular vehicle for passing around good and bad comments about a business. Both these tools are easy to use and implement, and allow you to put in keywords and receive daily alerts based on chosen keywords. Keywords you choose should include your business name and your name as the owner at a minimum. You may also want to perform alerts for your competitors and their brands so you can do a bit of competitive “spying.” While I wouldn’t suggest you act in a malicious way to a competitor, nonetheless it provides you an opportunity to know both their strengths and weaknesses. For example, if you promote price as a differentiator but your customer reviews tend to mention wide range of choice more – but your competitor reviews highlight price as the reason they bought from them, then you may need to rethink your marketing. I know I’ve drifted off topic, but as you can see reviews can provide you information you’d otherwise miss. While some of the “listening applications” can generate a lot of information for a large brand company to wade through, it’s unlikely a local business will generate an overwhelming amount of alerts or tweets in a day, so I’ve tended to find the results from these tools are manageable. So the alerts have turned up in your email inbox or in your RSS reader and you’ve clicked to find out what was said about you. Not every alert will require a response. If you’re active in your community then you’ll get mentions in local blogs and online news media. Most of these don’t require a follow-up from you. The mentions and reviews you need to respond to will be obvious. When you read them they’ll either invoke the “Wow Factor” as in what a nice thing to say about my business in public, or you’ll experience a sensation of dread in the pit of your stomach. I have known both. Either of these deserves a response. When somebody says something really positive about your business it’s fun to respond. But even here it’s important to respond quickly and let the reviewer know you appreciate the comment. People like to be recognized and thanked, and when you respond sincerely they’re more likely to partake in “word of mouth” marketing offline on your behalf – which is critical for a local business. The bad comments or reviews demand careful consideration before responding. A local business should always attempt to correct the situation with the customer offline, and if it gets resolved ask the reviewer to go back and add to the review the final outcome. Always respond to negative reviews as your future customers will be reading and making decisions on reviews, and an unanswered negative comment conveys you don’t care what people say about you. If what they say is basically true and you were just having a bad day admit it, and briefly explain what you did to rectify it and move on. No local business is perfect. If your business model allows provide a refund, as it conveys you made the ultimate business sacrifice to correct the issue. Give yourself 24 hours before posting the review, and have somebody else review your response. This will ensure you’re not reacting too defensively. Don’t argue or get personal – even if they did – it looks unprofessional and gets messy and nobody wins. Keep your response as short as possible, and end on a positive but conclusive note. Scott Clark over at buzzmaven has a 15 tips for responding to Google Place Page reviews post I recommend for further suggestions. If you’re a SEO company who manages Online Reputation Management for your clients, then for your local business clients I believe you can do the monitoring and review components, but when it comes to the response the words need to come from a “voice” in the company. Online reputation management for a local business is becoming increasingly important as more small businesses conduct lead generation and commerce on the Internet. Having a process in place at the start to handle good and bad reviews of your business will be a key component of your online success. Three really great points covered about monitoring local reputation online. I especially like the idea of setting up a Google alert, perhaps with the business title as the keyword. Showing a small business owner this strategy could potentially give them solid insight into what is being said about their company. Thanks! Thanks Lou. Glad you found the tips useful.